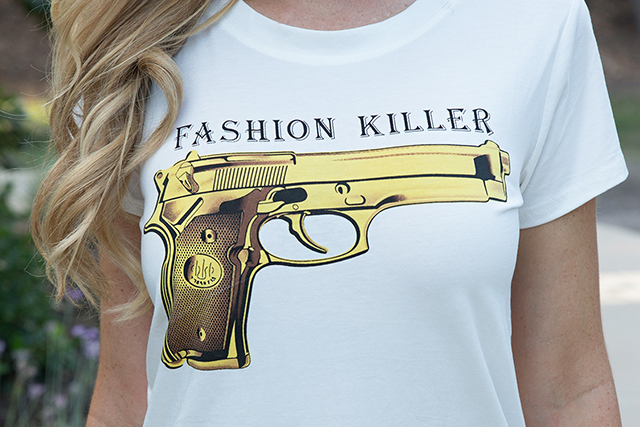 If you google search "Fashion Killer T-shirt" you can find countless online boutiques selling this graphic print t-shirt. I came across it on AliExpress.com but I refuse to buy anything else from that site because half of the items I ordered never arrived and most that arrived were such poor quality that I wouldn't even wear them around the house. This shirt, however, was the exception. The material is super soft and comfy and while I haven't washed it yet, the silk screening seems to be done well. I originally bought this shirt thinking that it would be fun and cute to wear to the gun range. I could never shoot a living animal but I do enjoy shooting paper targets and sporting clays every once in awhile. (You never know when the zombie apocalypse will hit and you'll need these invaluable skills. lol.) I'm clearly not at the gun range here but I just couldn't wait any longer. When I get new clothes I want to wear them almost instantaneously, it's an intense feeling, and this shirt has been sitting in my closet for months! I planned on wearing my Fashion Killer T-shirt with ripped jeans and Converse to the gun range but since I couldn't wait any longer I was able to dress things up a bit more for a day around town. If you subscribe to my YouTube Channel then you've most likely already seen this white beauty in my Chanel Unboxing Video. She is the Chanel Grand Shopping Tote, often referred to as the GST, in white caviar leather with silver hardware. I adore this bag and try to baby it as much as I can. I especially love how the quilting on my purse matches the quilting details down the sides of my pants. These pointy-toe bow heels are my absolute favorite shoes right now! They are so chic and most importantly, incredibly comfortable. I get quite a bit of compliments on them and can wear them with so many different outfits. Thank you so much for stopping by the blog! I have some exciting things coming up this month and some more spare time to spend blogging and making videos for my YouTube channel. I appreciate all the love an support.